Community Action to Transform Cale Habitat (CATCH) is a volunteer community group founded by two local dads, Gary Hunt and Matt Bishop in November 2012. The groups objective is to improve and maintain the habitat of the River Cale in the Wincanton area, whilst encouraging a diverse, natural balance of wildlife. The River Cale was used for industrial purposes for many years, and has been shaped by human needs at various points (dredging, etc). It suffered at the hands of humans in 2000 when a slurry spill resulted in a huge number fish & invertebrates being eradicated. In September of 2011 a local cheese factory suffered a devastating fire, with the run off water containing dairy product which de-oxygenated the river and killed further numbers of fish. The project began with simple things like organised litter picks, and clearing out some of the historical debris from the river. Later in 2013 we invited the Wild Trout Trust to survey the river, and give advice and guidance on where and how we could make improvements. Using their advisory report as the foundation for our group, we continue to nurture the once forgotten urban river. Families are so important to us, ensuring they have quality time together, out in the fresh air whilst enjoying each other’s company. The river gives us that opportunity and at the same time gets friends and families out enjoying nature at its best. The River Cale runs for approximately thirteen miles from its source to the confluence with the Dorset river Stour. At present our efforts are mostly concentrated on the stretch flowing through Wincanton and about a mile south of the A303. Our aim is to eventually monitor and evolve the entire length of the river Cale. 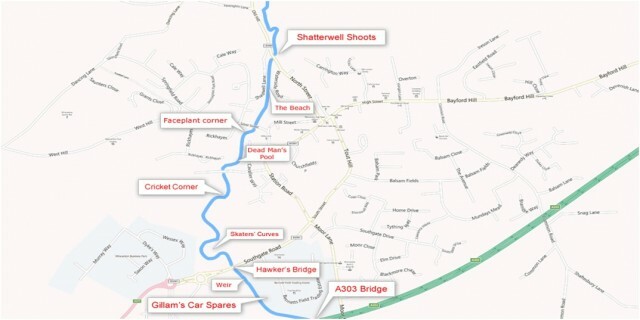 The map below shows our primary area of operation. If you have a particular concern about, or interest in, some other part of the river and would like to share it with us, or ask us for help and/or advice on dealing with a particular issue, please do not hesitate to get in touch. If we cannot help you directly, we’ll try to rustle up one of our contacts who can!